AUCKLAND, New Zealand - The Camilo Speranza-era is off to a flying start after Auckland City FC beat Waitakere United 5-1 in their National Youth League opener at McLeod Road today. A hat-trick from Justin Bailey coupled by a neat header from Thomas Drilien and a late strike from substitute Brad Wilson cancelled out a consolation goal by Tawanda Marowa. The Junior Navy Blues were on the backfoot in the opening exchanges but a three goal salvo in the space of seven minutes midway through the first half gave Waitakere United a mountain to climb. Bailey set the ball rolling with the first latching onto a second ball from a free-kick before Drilien turned home an impressive header from an acute angle moments later. It was a fine goal by Drilien who was also on target for the first team in their 4-0 pre-season friendly victory over Waitakere United on the same ground last Wednesday. 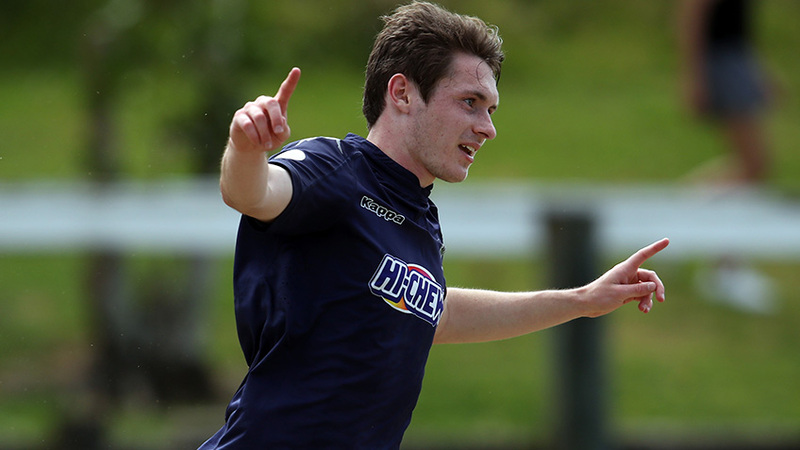 Waitakere United were still reeling when Bailey added a quickfire third. The visitors problems mounted when they had a stonewall penalty turned down on the half-hour mark. The match was firmly in Auckland City FC's control but that didn't tell the full story as Waitakere United remained competitive in midfield and always carried an attacking threat - their problems were mostly defensive. And so it proved when Bailey completed his treble with a stunning long range strike that dipped late under the crossbar just five minutes into the second half. Marowa gave Waitakere United a glimmer of hope when he jinked past the Junior Navy Blues defence to finish beyond Cameron Brown only for Spragg to almost restore the four goal buffer when he scuffed his shot into the base of the visitor's post. The final word went to the home side when Wilson tucked away a fine goal with two minutes left to ensure Speranza's tenure begins brightly. Hat-trick hero Bailey was pleased with the win and his treble. "The win was great for the boys because we've had a tough pre-season not getting results we wanted but we stuck together today and got the win. "With my third goal I was told to keep a hold of the ball but I didn't see any options and decided to hit it and it's gone in and I'm very grateful it did. "Waitakere dominated us for long periods of the game and they were very hard to break down. Attacking they are very solid and the key difference was we took our chances and they didn't," he told www.aucklandcityfc.com. Camilo Speranza was pleased with a winning start but echoed the words of Bailey about the performance of Waitakere United. "We are happy because of the result of course but I don't think we should dwell on that, we have to see beyond the result because in my opinion the score doesn't reflect the reality of the game and we need to be objective about this. "There were a few moments in which we were better and in which they were better than us and knowing that we have a lot to work on," he said. The new Junior Navy Blues coach, who also heads up Auckland City FC's Player Development Programme, was effusive in his praise for Bailey. "Justin did very well he has a great attitude in training and he is always very very professional in what he does so I'm very happy with him. "We have individuals that can be dangerous in the opposite penalty box but we need to be focused on our processes and not only on the outcome and we're very happy with the outcome today but we have a lot to work on in our processes," he said. The Junior Navy Blues next National Youth League match is away to Southern United at Tahuna Park, Dunedin, on Saturday 27 October 2018. The match kicks off at 1pm NZST. AC: 1. Cameron BROWN (GK), 2. Nathan LOBO (Daniel THIBAUD 75'), 3. Jackson WOODS, 5. Dhanush CHANDRA (Micaiah PAPA 54'), 7. Justin BAILEY, 8. Oscar SPRAGG (Brad WILSON 81'), 9. Thomas DRILIEN, 11. James GREEN (Robert TIPELU 46'), 12. Aidan CAREY, 13. Josh JONES (c), 21. Callum McNEIL. SUB NOT USED: Sam BOTTOMLY (GK).